Develop relationships with the industry’s leading precast manufacturers and suppliers and ultimately grow your business in the sector. By belonging to the precast industry’s peak body your company is listed on our website, your staff can attend and share knowledge through educational presentations at our quarterly national member events. Read more about what’s on offer below. Provide you with valuable networking opportunities via registering to attend our regular Member-only quarterly dinners and meetings. Allow you to give educational presentations at our quarterly Member meetings, which develop your credibility with the membership (including promoting your services and distributing material). Raise awareness about your services in the broader industry, by featuring in one of our regular website home page ‘News’ articles. Provide you with free subscriptions to Roads & Civil Australia and Construction Engineering Australia magazines. Organise national educational workshops or seminars, for precasters and other stakeholders (both Members and non-members). Allow you to use the National Precast Member logo to promote your company as a Professional Associate Member of National Precast. Provide you with the opportunity to nominate for National Precast committees. Provide you with the opportunity to represent National Precast on Standards Australia committees. These are held four times a year in different States. 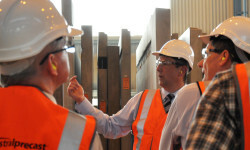 At Members’ Meetings you are able to draw upon the knowledge and experience of precast manufacturers and other professionals, to assist you with challenges you are facing. You will hear from suppliers about new products, as well as about the latest legal, safety, finance and insurance issues facing the industry. You will be kept abreast of latest research, will be able to go on the occasional site/factory tour and will have the opportunity to have your questions answered. The meetings are a fantastic way to learn, exchange information and form strong relationships with others in the industry. We provide our Members with the opportunity to nominate for National Precast committees and to represent National Precast on Standards Australia committees. We work in conjunction with and on behalf of our Members to represent their interests to State and Federal Governments, Safe Work Australia, Standards Australia and several key industry groups. You will receive regular Member-only emails to stay informed with the latest industry issues. We provide you with trusted and up-to-date information about the industry and related issues. Our ‘Safety Snapshots’ help our Members to keep abreast of and comply with the latest Workplace Health & Safety developments. We also provide you with free subscriptions to Roads & Civil Australia and Construction Engineering Australia magazines. Your services will be referred to both Members and non-Members. Over the last 12 months we have made thousands of Member referrals to developers, precasters, architects, engineers and builders. You can promote yourself as a National Precast Professional Associate Organisation Member on your website, promotional material and stationery. We provide the opportunity for our Members to co-brand their marketing with ours. Advertising yourself as a Member of National Precast provides you with the ability to supply your customers with an extra level of reassurance.